This is a great protein packed breakfast that doesn’t take to long to prepare if you prep. I usually will fix the turkey sausage and the vegetables ahead of time and freeze in portions for one casserole. I usually will do this on the weekend while I’m cooking dinner or in the kitchen working on something else. When I want to prepare the casserole, I pull a pack out of the freezer and pop in the microwave for 2 minutes to thaw it out and it is ready to go! First, we need to make the turkey sausage. Original recipe is located over at Heavenly Homemakers. Place your ground turkey in a bowl and add all the spices. Mix thoroughly. Transfer the mixture to a non-stick frying pan and cook the turkey until it is no longer pink. Let the mix cool. Next I prepare the vegetables for the casserole to place in freezer packs with the sausage. I dice up a green bell pepper, a red bell pepper, and a sweet onion. I then sauté the vegetables on the stove until they are softened. I usually will then add a little bit of butter, 1 Tbsp chili powder, 2 tsp season salt, and 1 tsp smoked paprika (all spices to your taste, I usually add more chili powder) to the vegetables and let that cook down a bit. Let the vegetables cool. Once the vegetables and turkey sausage are cool, I split them in to three portions and place in freezer bags. Place eggs in a mixing bowl with the milk and scramble with a whisk. Once mixed, add the turkey sausage and mixed vegetables that have been thawed in the microwave. Then add the cheese and mix. Spray a small casserole dish with non-stick cooking spray. Pre-heat the oven to 400˚. 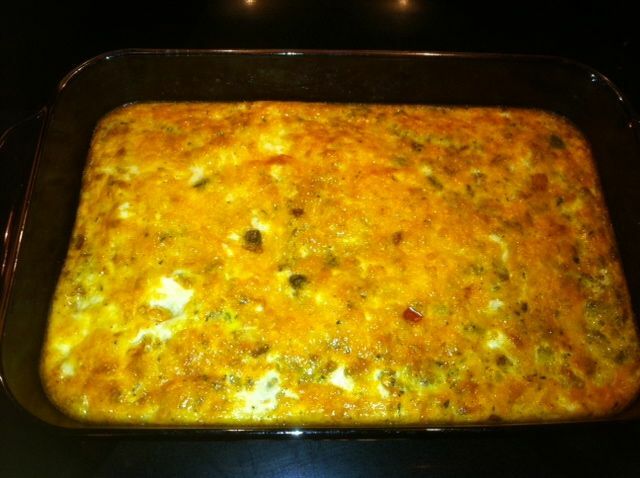 Bake the mixture in the oven for 20-30 minutes depending on how set you want your eggs. I usually go for the 30 minutes but I like everything cooked completely and a little brown. Let the casserole sit for 5 minutes prior to serving. This will last in the fridge for a few days. I normally will fix it one morning for breakfast and we have left overs the next morning. You can also experiment with this recipe. I have added a pinch of nutmeg to the mix and also substituted the milk with Heavy Cream for a creamier texture. You can even try different vegetables or add ham to the casserole instead of turkey sausage. Enjoy! I love the idea to make your own turkey sausage. Pinned it to my breakfast recipes to try board!